With its stripe-awning exterior the Covent Garden Hotel is a pretty addition to the shops and cafes of Monmouth Street. Inside, the drawing room, private screening room, Tiffanys Library and Brasserie Max add up to a relaxed yet luxurious place to stay. Popular with celebrities and a fashionista favorite. Popular with celebrities (A-listers like Kylie Minogue and Bono have stayed here), theatre goers and a fashionista favorite, Tim and Kit Kemp's Covent Garden Hotel is well-situated on Monmouth Street - a Seven Dials street filled with chi-chi shops like Orla Kiely, Miller Harris, and the famous Monmouth Coffee Shop. The 58-room hotel, one of seven boutique hotels owned by the Firmdale group in London, is just paces away from the shops, bars, restaurants and theatres of Covent Garden and Soho. But the beauty of this hotel is that each room is individually decorated in Kit Kemp's signature English eccentric style so it's always a pleasant surprise to discover which room you're given when you check in. A jewel in the crown is the Loft Suite a sprawling penthouse split over two levels on the upper floors. The private screening room is another highlight, the venue for the Sunday film club and available for private hire. The hotel also has a small gym in the basement, its own bar and Brasserie Max restaurant, and an honesty bar in the guests-only wood panelled first floor library. Loose leaf tea, scones, cakes and sandwiches make for quite a feast. Afternoon tea is served all day at the Covent Garden Hotel's buzzy Brasserie Max restaurant. 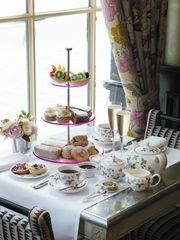 The superior Covent Garden Tea comes on a glass three tiered cake stand laden with sweet treats like chocolate and macadamia slice, banoffee pie, mango and coconut millefeuille, elderflower jelly, passionfruit meringue, warm scones and fresh sandwiches. Gentlemen's Tea includes more substantial morsels of fish goujons and French fries with tartare sauce, crab and coriander burger, Covent Garden club sandwich, and steak sandwich, Scotch egg, and cake of the day. Loose leaf tea not quite quenching your thirst? There's the option to add a glass of fizz or Meantime pale ale for the gents. Modern British cuisine, popular with non-residents and residents alike. 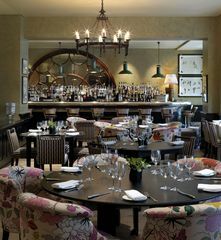 The restaurant at the Firmdale's Covent Garden Hotel on Monmouth Street, Brasserie Max is a buzzy bar and restaurant - used in Woody Allen's 'Match Point' - which is popular for pre- and post-theatre dining. Serving modern British cuisine, the emphasis is on fresh, seasonal produce like slow cooked Cornish lamb shank with Cheddar mash and fish pie with generous chunks of salmon, scallops and prawns. Desserts offer choices of chocolate millefeuille served with malted milk ice cream, lemon tart, or mango and coconut semifreddo with salted caramel and sesame brittle. There is a wide selection of wines by the glass, and - as the Brasserie in the title suggests - it's open all day everyday. The hotel's regular Saturday Film Club offers an intimate cinema experience. 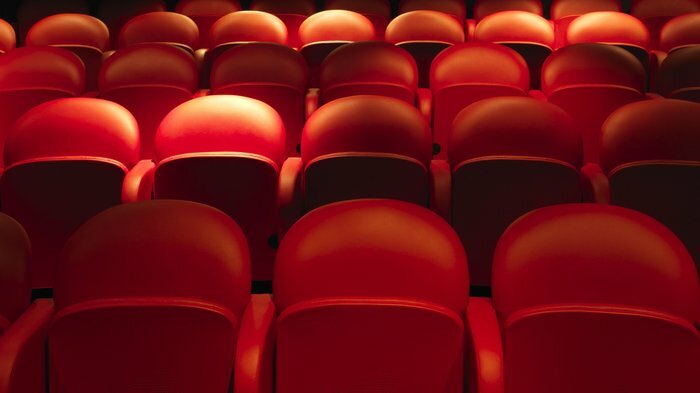 The regular Saturday Film Club offers film fans a intimate cinema experience in the hotel's screening room - open to both hotel residents and members of the public. Dine in Brasserie Max, the Covent Garden Hotel's restaurant and bar, and then see the film of the week in the private leather seated cinema downstairs which accommodates a select audience of up to 47 people - so much more civilised than some overpriced popcorn and sticky carpets at your local Odeon. The movie changes each week, from a classic to a latest release, and you can also combine it with afternoon tea, taking tea and cake before the 8pm screening. Great for a date. Small but functional gym and one beauty treatment room. The small, but functional fitness room is complimentary for all hotel guests and is accessible 24 hours a day. It has the very latest life fitness resistance and aerobic machines as well as a range of free weights, with Swiss and medicine balls supplied. One-to-one yoga sessions can be booked in advance and take place in the privacy of your own hotel room. There's one beauty treatment room at the hotel where unisex treatments including full body massage, facial, manicure and pedicure are available. Guests can also book in-room treatments (at an additional cost) in advance. From cheap budget places to stay to luxury 5 star hotels see our special offers for hotels, including DoubleTree by Hilton Hotel London - ExCel from 81% off.